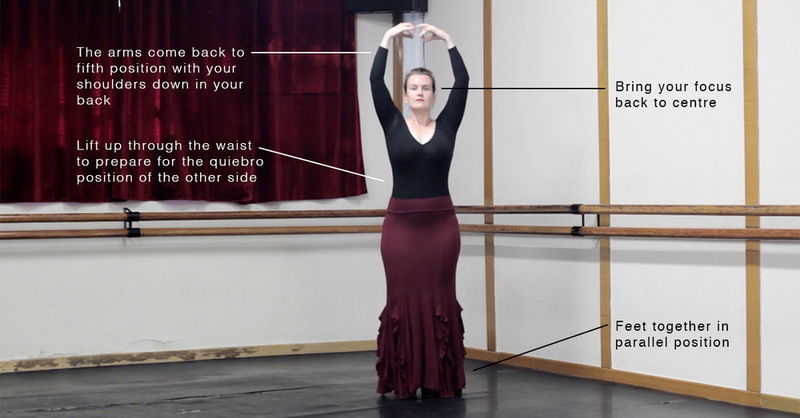 This is part 5 of a series of lessons about the quiebro posture used in flamenco dance. For the feet, the same leg as arm will step out to the diagonal and then come back to centre with both feet together under the hips. When you step out put a little weight into the foot, don't just tap it on the floor. Remember to lift the torso up before you rotate and tilt into the quiebro position. Just like the last marcaje con quiebro, the location of your focus is very important. When you are looking over your shoulder don't look straight down at the floor, the angle of your gaze should be approximately the same as the angle of your shoulders. Then when you come back to centre look straight ahead before your change to the other side. I actually found this marcaje more challenging than the marcaje in part 4. I think you have to work very hard not to let the torso collapse in the quiebro position. Keep trying to lift up the breast bone and maintain an open chest to stop your upper body from falling in on itself. What do you think? Is this marcaje harder for you? Let us know if you have any questions in the comments below.